In the fading light of a dying star, a soldier for hire searches for a missing refugee ship and uncovers a universe-shattering secret. Asala Sikou is used to looking after number one while crisis reigns in her dying planetary system. But when she's hired to find a missing refugee ship, she discovers that this is no ordinary rescue mission, and she must play a role in deciding the fate of the whole universe. 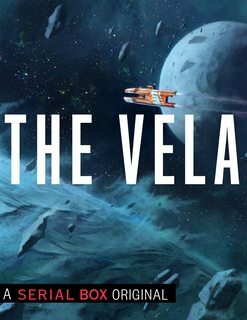 I've been looking forward to reading The Vela, the latest series from publisher Serial Box, ever since it was first announced several months ago, but my interest wasn't based on the strength of the pitch ("The Expanse meets Battlestar Galactica" -- I've only watched one episode of each show, and read none of the James S.A. Corey books). For me, it was all about the amazing writing team: Becky Chambers, S.L. Huang, Rivers Solomon, and Yoon Ha Lee. I had a hard time imagining a better group to collaborate on a story about political intrigue and space battles in a dying solar system. I've now been fortunate enough to read the first five episodes, and I'm here to tell you that I was right: this is a dream team of writers, and so far they are doing something really special with this story. There are so many things I could enthuse about, but I'll keep myself to just a few (especially as I'm trying to avoid sharing any spoilers -- don't worry, once the whole season is released, I'm sure I'll be back to talk about the whole thing). Starting with the characters, because the characters are so wonderful. The two primary characters, Asala and Niko, are both fascinating, and although very different -- Asala is a hardened soldier, while Niko is a child of privilege who is idealistic to the bone -- and sometimes work at cross purposes, they make a perfect team, and I've enjoyed watching their camaraderie grow. The story is also full of excellent secondary and background characters that make the world feel real and populated. Another thing this story does really well is build tension. In different ways across different episodes, I found that information was revealed at just the right rate to keep me guessing and keep me turning the (metaphorical) pages. There are a lot of surprises in this series, is what I'm saying, and I look forward to discovering what I'm sure awaits me in the later installments. Finally, I want to mention is how well the structure of the story uses the strengths of each individual writer. As with the tension section, I can't talk about just how without giving away too much. But if you already know and love these authors, I think you'll be happy with what you see, and if you don't, these episodes make for a brilliant introduction to all four of them. So if you haven't guessed by now, I definitely recommend that you check out this series. If you'd like a taste, Tor.com provides an except of the first episode, by S.L. Huang. And if you do check it out, let me know what you think!